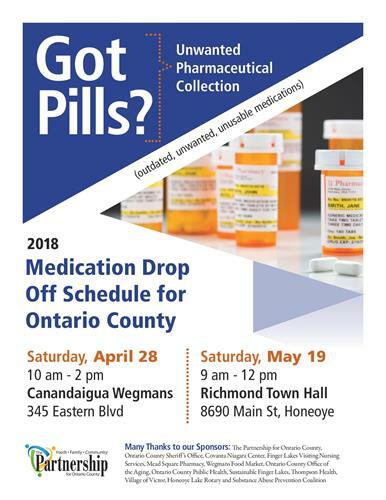 The Ontario County Sheriff's Office will be hosting a medication take back event on Saturday, April 28th from 10am - 2pm at the Canandaigua Wegmans. Participants can drop off any unwanted, unused, expired over-the-counter, prescription or pet medications at this event. We can also collect liquid medications and needles at this event. Please place needles in a hard plastic container (i.e. laundry jug) or sharps collection container. This event is sponsored by the Substance Abuse Prevention Coalition of Ontario County, Wegmans, Thompson Hospital, Office of the Aging and many others.